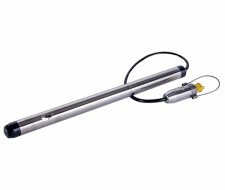 SCAIME level dataloggers, produced in stainless steel, can store up to 1,500,000 level measurements. Designed to ensure very low power consumption, these dataloggers have a precision level of 0.1%. It is also possible to measure fluid conductivity as an optional extra. PC software can be used to set datalogging frequency, start date and end date. A version in titanium is also available.